Here are some old pictures I took in Malaysia and Singapore on our trip to meet Ai's family in March of 2010. The sad thing was, these had been sitting on the SD card in the camera for over a year -- I only finally dumped them when I got the new iMac and Aperture 3 (which could finally read the RAW format my point-and-shoot uses). I had thought I'd at least dumped them onto disk somewhere, but apparently not. Anyway, I went through them, processed them and now they're up on Flickr. 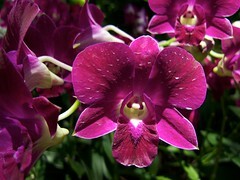 And yes, I took a lot of pictures of orchids... I really liked the Singapore Botanic Gardens (other than the debilitating heat and humidity, of course) and I totally abused my Sophia student ID to get into the Orchid Garden for cheap.